A loan of $1,000 helped to sell more cookstoves. Aged 42 and a married father of two children, [Alexandre] is a man who loves to invest in different activities. Although he has other businesses, he wants to invest in protecting the environment. For some months now he has been selling cookstoves. But he wants to increase his stock, so that he can earn more. This is why he seeks a loan through Kiva. Determined, jovial, engaged, [Alexandre] is ready to ensure his family's well-being. Translated from French by Kiva volunteer Lindsay Ferrara. View original language description. Âgé de 42 ans, marié père de deux enfants. Il est un homme qui aime s’investir dans différentes activités. Malgré qu’il ait d’autres activités économiques, il tient à s’investir d’avantages dans la protection de l’environnement. Depuis quelques mois il est dans la vente des réchauds. Maintenant il veut augmenter son stock pour faire plus de bénéfice c’est pourquoi il fait appel à Kiva pour l’aider en ce sens. Déterminé, Jovial, engagé, il est prêt à tout pour assurer le bien-être de sa famille. It provides access to an ecological and healthy way of cooking. This loan helps retailers in Haiti offer cookstoves to their clients. Retailers, who typically own pre-existing small businesses and wish to add stoves to their inventories, are responsible for repaying the cost of the stoves in installments over the course of the loan term. By supporting this loan, you help the end users reduce charcoal expenses and avoid health complications, while also reducing carbon emissions and alleviating pressure on Haiti's forests. 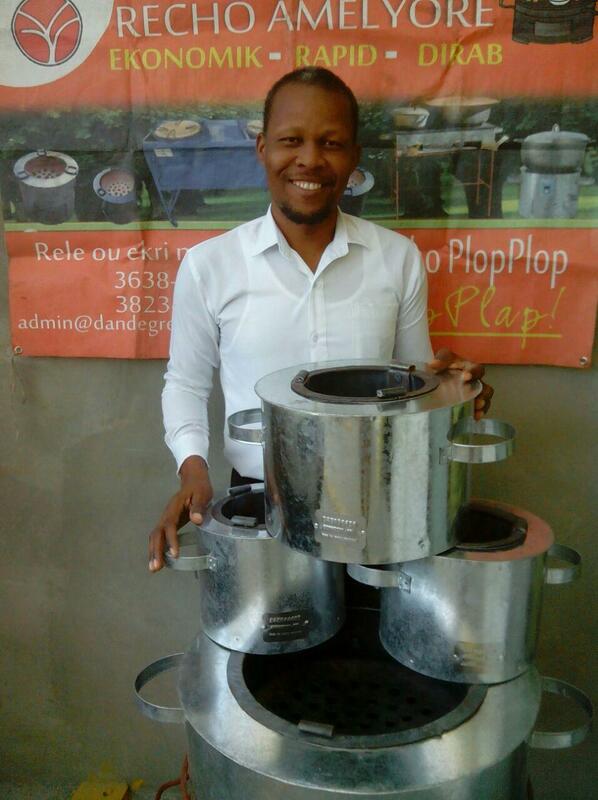 D&E Green Enterprises is a social enterprise that provides an alternative to inefficient and polluting charcoal cookstoves by manufacturing energy efficient cookstoves locally. D&E uses Kiva capital to provide loans to its distributors for buying inventory, motorbikes or marketing materials. Kiva supports D&E’s work to create jobs locally, and provide stoves that improve fuel efficiency, increase disposable income for lower income households and lower exposure to harmful pollutants.